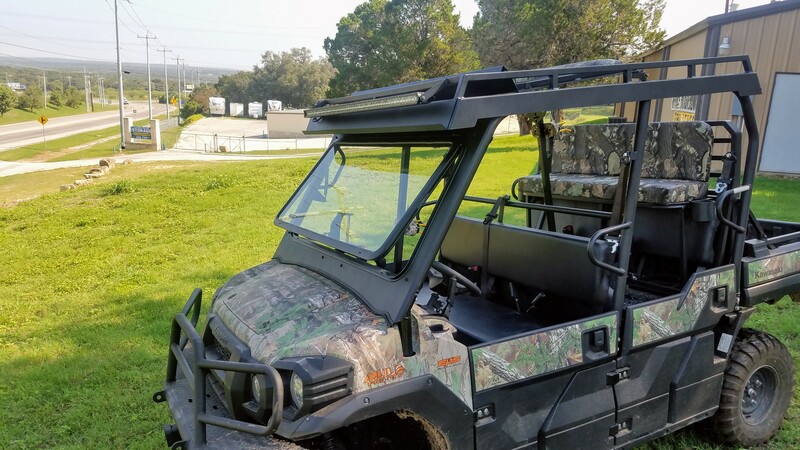 Fortress tip out windshield for the Kawasaki Mule Pro FX & FXT UTV models is a solid option. Simply put, it allows for a mode that keeps windshield all the way open, or a vent mode (approximately 5 inches outward) allowing just air circulation. A powder coated metal frame that is formed perfectly to the front and overhead roll bar frame securely snugs the Fortress windshield with loop clamps. No noise, no rattle, no squeaks! Works with most roofs on the market including our Ranch Armor metal tops for the Mule Pro's. 2 gas shocks hold the windshield up when in upright position. Handle used to lock window down also acts as the prop lock to hold window in "vent" mode.